It happens to the best of us: you leave the house, drive away, and realize you left the lights on. 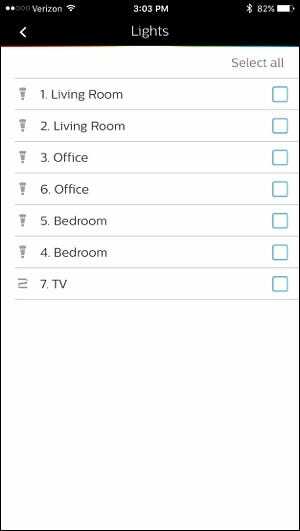 With Hue, you don’t need to worry about that anymore: you can set your lights to turn off automatically whenever you leave the house (and turn them on automatically when you return home). 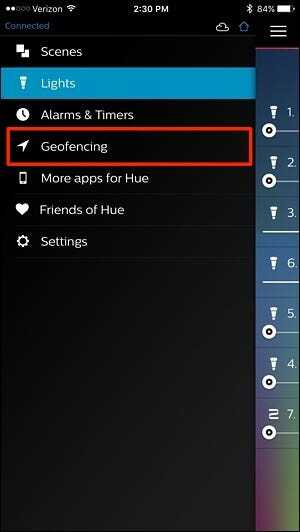 Hue does this using a feature called geofencing, which is a fancy term that describes a virtual fence surrounding a specific location. When you enter or leave that fenced-in area, a specific action happens. 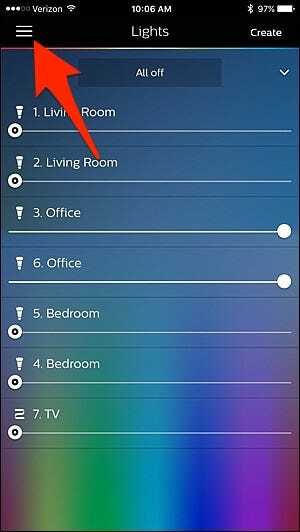 In this case, your Philips Hue lights can turn on when you enter that virtual fenced-in area, and they can turn off when you leave. 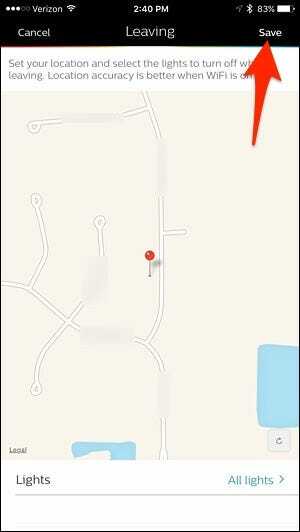 Geofencing uses a combination of your phone’s GPS, Wi-Fi, and cellular radio to determine your location. That combination allows your phone to preserve battery more than other GPS-focused apps, making this a decently efficient trick. It isn’t going to drain your battery like, say, a navigation app would. 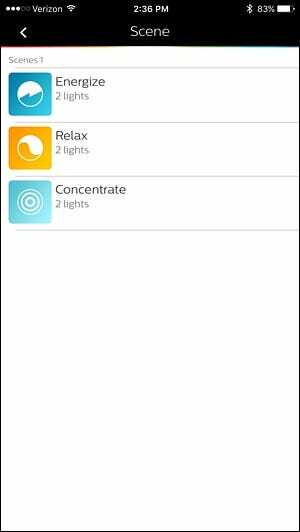 To set this up, open the Philips Hue app on your phone and tap on the menu icon in the top-left corner. 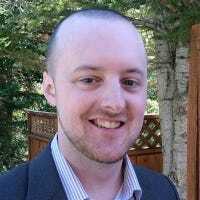 If “Geofencing” is grayed out, this means the Philips Hue apps doesn’t have permission to use your location, so you’ll need to go into the settings on your iPhone or Android device and give it access. Once you’re in, there are two geofencing options to choose from: “Arriving” and “Leaving”, and you can enable both if you want. To have your lights automatically turn off when you leave, select “Leaving”. Tap on “Lights” at the bottom. Select which lights you want turned off when you leave the house. Tap on “Select all” to select all of them at once. 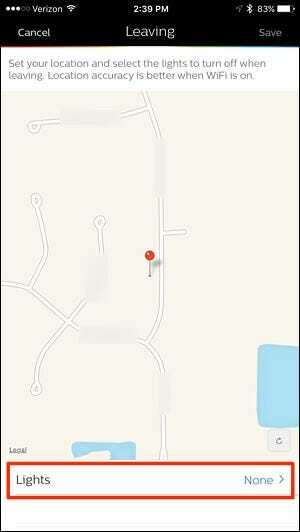 Then tap on the arrow in the top-left corner when done. 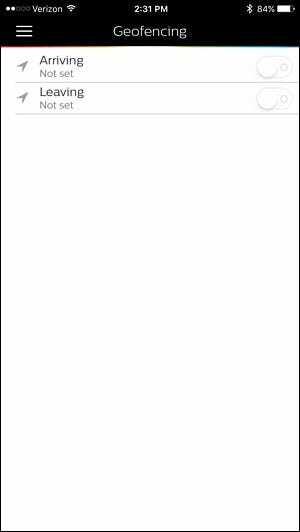 Tap “Save” in the top-right corner. If you want to turn your lights on when you return home, the process is very similar. 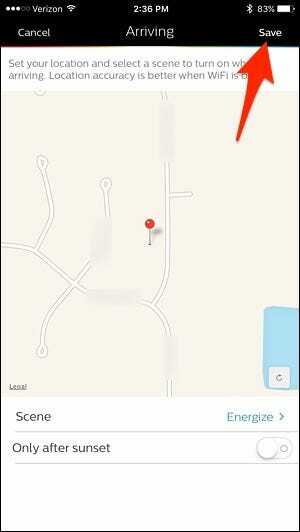 Flip the “Arriving” switch to on, and then tap on “Scene” at the bottom of the next screen. Select a scene that will activate when you arrive home. 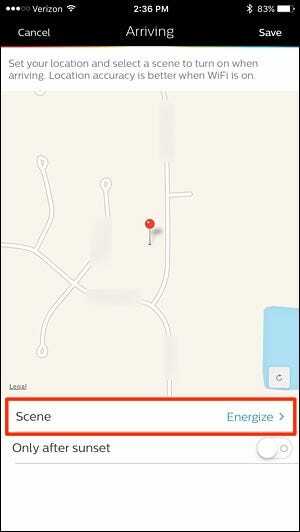 Below “Scene”, you can enable “Only after sunset” which will only activate the “Arriving” geofencing feature when it’s dark out. Otherwise, it will be disabled. 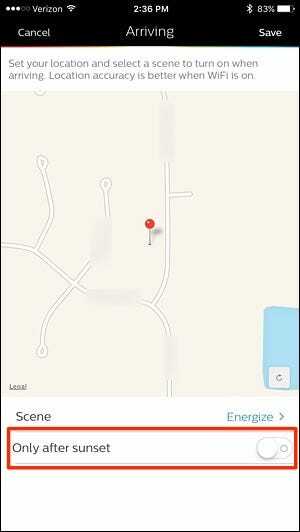 Geofencing is now enabled and your lights will automatically turn on and off when you get home and leave, respectively. Keep in mind that while this won’t use as much battery as a navigation app, it will still drain your phone’s battery quicker than if you had this feature disabled, so you may experience a slight hit on battery life with geofencing enabled.